Welcome on the Homepage of Ftronik! Here you get as a customer and as a reseller interesting offers of selected technical services. 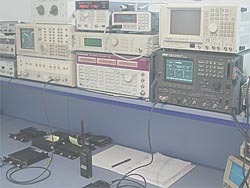 We repair your modern measurement equipment with audio 2 - way transceiver, radio communications tester and RF - components. On the spot we will build for a low price radio equipment, door phones or install antennas. Also we can produce radio - and laboratory tables made to measure. Take our services in ! We would gladly give your detailed cost estimate.